Paul Pogba starred as Manchester United ran out comfortable 3-0 winners over Fulham at Craven Cottage this afternoon. Victory has moved us into fourth spot and a Champions League place ahead of Chelsea’s trip to Manchester City on Sunday. 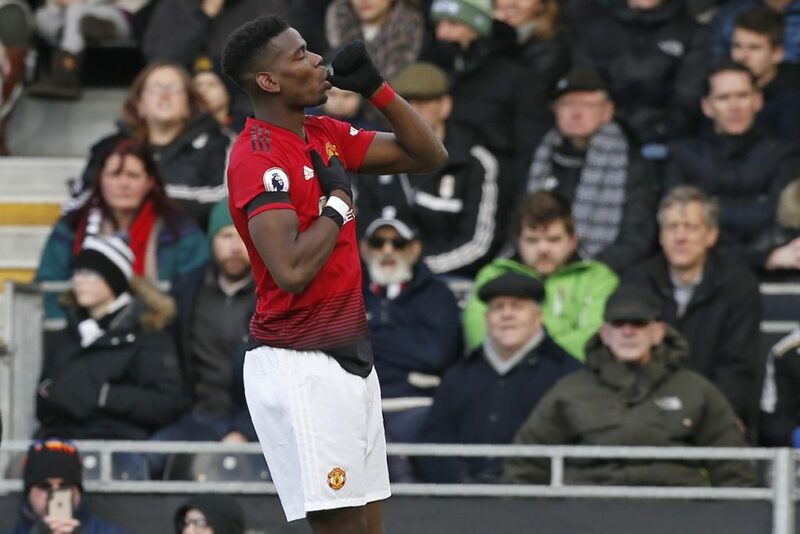 Paul Pogba opened the scoring in the opening quarter of an hour with a powerful effort that caught Fulham goalkeeper Sergio Rico out at his near post. Less than 10 minutes later Anthony Martial doubled our lead with a fine solo run and finish. Juan Mata was tripped up inside the penalty area midway through the second half from which Pogba converted the ensuing penalty kick to make it eight goals in his last eight Premier League appearances. David de Gea 6 – Made one decent save in the first half but otherwise Fulham didn’t threaten David de Gea’s goal. Diogo Dalot 8 – Luciano Vietto had an excellent chance at the back post in the opening six minutes but after that we were very comfortable defending against Ryan Babel. Looked good going forward on occasion. Chris Smalling 7 – Recovered after two mistakes in the opening minutes that gifted Fulham chances. Won his aerial battles versus Fulham top scorer Aleksandar Mitrovic as our defence protected David de Gea very well this afternoon. Phil Jones 9 – Excellent performance in decent from Phil Jones who also forced a save out of Sergio Rico from 25 yards in the first half. The centre-back brought the ball forward to help start attacks. Luke Shaw 8 – Comfortable game defensively for Luke Shaw who showed lots of energy going forward down the left without creating anything of note. Nemanja Matic 7 – Was careless in midfield at times and also picked up a yellow card for his efforts. Nemanja Matic made a couple of nice passes in the final third as Fulham’s defence were wide open at times. Ander Herrera 7 – Kept the ball ticking over in midfield and seemed to get keen on the scoresheet without any luck. Paul Pogba 10 – An outstanding performance in the middle of the park as Paul Pogba ran the show and got on the scoresheet twice before being replaced for the final 15 minutes with Paris Saint-Germain in mind. Juan Mata 7 – Rarely lost possession down the right wing nor in the middle when he drifted inside. Juan Mata created a couple of chances in the final third and won the penalty from which Paul Pogba scored our third. Romelu Lukaku 5 – Body language wasn’t great and spent a lot of time pulling out wide on the right and didn’t even test Sergio Rico himself. Anthony Martial 8 – Excellent first half from Anthony Martial who played in Paul Pogba for our opener and then scored an excellent solo effort to double our lead before half-time. The French international was a constant threat to the Fulham defence down the left wing. Went a bit quiet in the second half before being replaced by Alexis Sanchez for the final 20 minutes. Alexis Sanchez (22 mins) N/A – Missed an excellent opportunity shortly after coming on but created an excellent chance for Scott McTominay. Scott McTominay (18 mins) N/A – May feel disappointed for not getting on the scoresheet moments after replacing Paul Pogba. First run out since his stoppage time introduction in our 1-0 win at Tottenham Hotspur a month ago. Eric Bailly (6 mins) N/A – Replaced Ander Herrera to help see out the clean sheet in the final few minutes.